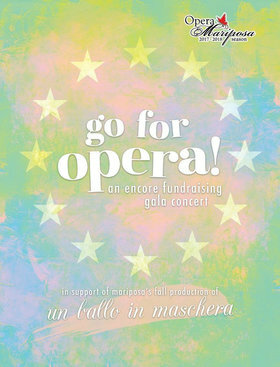 Join Opera Mariposa's award-winning artists for an encore performance of their acclaimed gala opera concert, back by popular demand! In Go For Opera, Frankfurt sopranos Heidi Muendel and Nancy Hasiuk and Metropolitan Opera Award-winner Robin Hahn return to the stage, alongside local audience favourites such as mezzo-soprano Melissa Ratcliff, tenor Mark Pepe and baritone William Liu. Enjoy an evening of beautiful operatic highlights including songs and scenes from Verdi's Un ballo in maschera, all in support of Mariposa's fall opera production.